It’s officially 2018, which means you’re hopefully getting a good start on New Year’s resolutions. Maybe this is the year you shed a few extra pounds or become more organized. But have you thought of ways to enhance the look of your home? Believe it or not, just a few simple tweaks can make a huge difference. 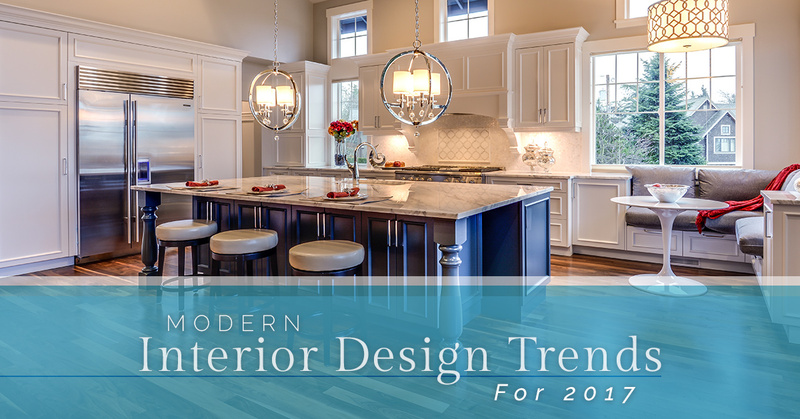 In 2018, home design trends revolve around being frugal, practical, eco-friendly, and comfortable. Keep reading as we dive into what’s popular this year in terms of interior design. Coziness – You have enough stress to manage. So shouldn’t your living space allow you to relax, unwind, and enjoy peaceful moments? Consider adding light room dividers, reading nooks, and other small spaces for different tasks. Just be sure to connect them to one open interior. Keep in mind that beautiful and comfortable areas such as these add charming, stylish coziness to your home. Even just decorating a few small areas can turn your space from dreary to luxurious. Modern colors – The possibilities are seemingly endless with regard to color choice. Are you thinking about creating a cozy and warm vibe? Then you may want to opt for earthy room colors. If you’d prefer a quiet and comfortable feel, then metal gray or gold should do the trick. Others trendy colors for modern home design in 2018 include white hues, gray color tones, terra-cotta, dark purplish red, and wine colors. Dark wood and bright lights – Many homeowners just aren’t sure what to do with small spaces. Dark wood is certainly one way to go, as it brings chocolate brown hues into interiors to give it a touch of luxury. Overall, a room that’s filled with wood and soft textiles is perfect for bright lighting design. The right combination of wood and lighting creates rooms that are both warm and spacious. Recycling – More people are using reclaimed materials to create the interior spaces of their dreams. Not only is it cost-effective, but the results can be spectacular. Should you choose a recycling project as the way to upgrade your home, be sure to account for unique furnishings and artworks. These should seamlessly blend with current color schemes and textures. Originality and frugal ideas – It’s one thing to look into modern home design projects for 2018. It’s another, though, to create spaces that reflect your personal style. A quick online search will reveal home decorating tips that are both modern and inexpensive. Even if you’re on a strict budget, you can make that space look absolutely incredible. Why Contact Our Custom Home Design Team? Soleil By Design is a premier interior design firm in Seattle. What sets us apart is that we have an extensive background in construction practices along with expertise in custom home design. Unlike other interior design companies, we never take a cookie-cutter approach. Each project is tailored to each of our clients because their lifestyle, vision, and overall goals are unique to them. At Soleil By Design, we don’t just settle for so-so results. Our award-winning interior designer strives to create practical and aesthetic solutions that go well beyond client expectations. Give your home’s interior the upgrade it deserves in 2018. Call us today.